Sleight or slight in the magic of the hands? Over Thanksgiving, my ex-husband was displaying some of his close-up magic skills. During one particularly dazzling card trick, he explained as part of his patter that he was using what we all heard to be a “slight of hand” technique. “Don’t you mean *sleight* [ie. rhyming with freight]?” I asked, and so did his wife who is also British. “No, it’s slight,” the amateur magician maintained. And I thought to myself: isn’t it odd that the Americans seem to use a different word in that expression, or is it simply that they’re pronouncing the right word wrongly? Well, it turned out that it was I who was mistaken. The correct word, on both sides of the Atlantic, is sleight, and the correct pronunciation — for both Yanks and Brits — is slaɪt, rhyming with kite. And whereas I’ve been spelling it right and pronouncing it wrong for nearly half a century, many people pronounce it correctly but write it down as slight or slide, thinking that’s how it’s spelled. “Sleight of hand”, also known as prestidigitation (“quick fingers”) or légerdemain (French for “light hand”), is a technique used by magicians and card sharps to surreptitiously hide or move cards, coins or other objects to produce an effect. The opposite of the sleight is the flourish, whereby the magician acts or gestures overtly, often to distract attention from something else he or she is doing (quite possibly a sleight). As the Online Etymology Dictionary explains, sleight as a noun meaning “cunning” was an early 14th-century alteration of sleahthe (c.1200), from the Old Norse sloegð meaning “cleverness, cunning, slyness”. 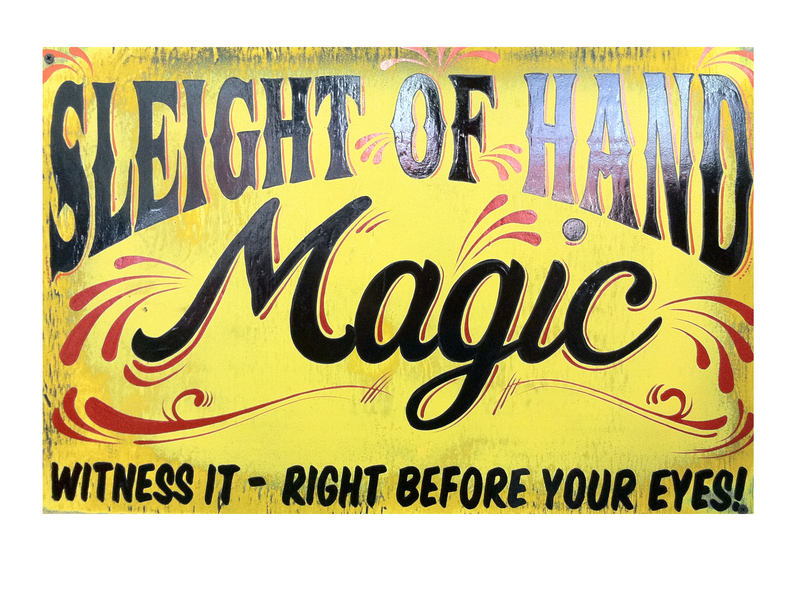 Sleight meant “skill, cleverness, dexterity” from the late 14th century, and its modern meaning of “feat or trick requiring quickness and nimbleness of the hands” is from the 1590s. The term “sleight of hand” is attested from c.1400. Because of the strange pronunciation, “sleight of hand” is often mistakenly written or understood as “slight of hand” or “slide of hand” — either of which (with slight coming from slettr, meaning “plain, flat, even, smooth, level”) would seem entirely appropriate for the magician’s cunning techniques. This entry was posted in Pronunciation, Words, phrases & expressions, Yanks vs. Brits and tagged card trick sleight, magic flourish, sleight of hand, sleight of hand pronunciation, sleight or slight of hand on December 2, 2013 by Louise. Here in Australia it rhymes with -ate like slate. More specifically the Macquarie Dictionary of Australian English lists both as acceptable pronunciations.